A full 150km north-south ski traverse of the mighty Liverpool Land ranges finishing in Greenland’s most remote village of Ittoqqortoormiit. This route has now become firmly established as the classic arctic ski tour for east Greenland. It’s also a firm favourite as a far more interesting, exciting and cheaper alternative to the full east-west crossing of Greenland. The route takes in tremendous glaciers, several icecaps, stunning mountain scenery, remote valleys, icebergs, sea ice, hot springs and local fauna. We'll begin the traverse with a half day snowmobile journey to Kap Greville in the north of Liverpool Land. From here you'll travel into the mountains, crossing the northern ice cap of Liverpool Land before dropping down to Calsberg Fjord. Heading inland again, you'll pass through stunning valleys, staying the night in a local hut close to natural hot springs. You'll then drop onto the eastern coast, with its numerous fjords, passing through these and over the southern ice cap. After arriving in Ittoqqortoormiit after 14-16 days skiing, you'll be picked up by snowmobile and transported back to Constable Point. Throughout the trip, you'll be hauling all your food and equipment in pulks. Expect days of 6-9 hours of skiing, moving camp every night. When in coastal areas, expect to take on a 'bear watch' shift every night, safeguarding the group from any polar bear encounters. For most of the trip, you'll have 24 hour daylight. The weather in north-east Greenland in April can be expected to be challenging. 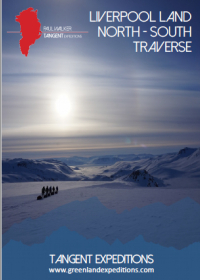 At the start of your traverse you may experience temperatures down to -30°C at night, and travel may be halted by incoming Arctic storms, which you'll sit out in your tents. However, temperatures up to +10°C are not unheard of by May, and it can get very hot as the sun reflects off the snow surface. Day 1: Team meets in Akureyri, Iceland for the flight to Constable Point. Here you will be greeted by Tangent staff and your guide for the trip will give an initial briefing and training session. You'll sort out all your equipment and food for the expedition. Day 2: Snowmobile transport to Kap Greville at the north end of Liverpool Land, where you'll spend the night. Days 3 - 19: Ski over 150km of mountains and glaciers to finish in the village of Ittoqqortoormiit. Day 20: Morning snowmobile transport back to Constable Point in time for your return flight to Iceland. Participants should be fit and capable of hauling heavy loads for several weeks. You should be fit enough to carry out the equivalent of 6-9 hour mountain walking days and have no significant knee or back problems. Previous experience of ski touring is preferred but not essential, as the traverse is mainly on relatively flat glaciers with no technical skiing. Hauling a pulk is not particularly technical, so the skills required will be picked up easily on the training day and traverse. Prior camping experience is essential, but full training will be given in the use of expedition tents and multifuel stoves. You will be required to cook for yourself throughout the traverse, and to pitch your own tent every night with your tent mates. Full insurance is needed for this trip, available through Tangent Expeditions. More details are available on our insurance page.